Clicking on a colored bar will bring that line of the file into view within the editor and move the cursor to the beginning of that line. The error stripe is the bar immediately to the right of the vertical scroll bar and provides a convenient means to quickly navigate among several elements of your code. The error stripe's vertical bar represents the entire length of the file currently displayed in the editor - not just what is visible at the moment. 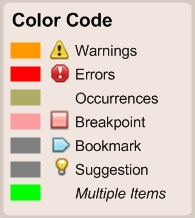 During the course of development, different colored bars (see color code at right) may appear from time to time to indicate a variety of conditions that exist throughout your code such as syntax errors, search results, breakpoint locations and so on. Each colored bar indicates the position of these conditions throughout the entire length of the file. To view a specific line, simply click on the colored bar and that line will be made visible in the editor and the cursor will be placed at its beginning. Two of the most useful indicators in the error stripe are Errors and Occurrences. The MPLAB® X editor has a live parsing feature which examines your code as you write it. If it detects any problems like syntax errors or other non-runtime problems, it will flag the line with a red bar in the error stripe and add an error icon on top of that line's number in the glyph margin. Occurrences are displayed in the error stripe under two related circumstances. First, if you perform a search and the IDE finds any matches in the currently displayed file, it will flag them with a gold bar in the error stripe and will also highlight them in the editor with a similar color. Second, if you select (highlight) something in the editor, any matches will automatically be highlighted and flagged in the error stripe as if you had performed a search. In both cases, you can quickly jump to each occurrence of the search result by clicking on the bar in the error stripe. Right-clicking on a line number or breakpoint icon produces a popup menu with additional options for breakpoints and bookmarks. The glyph margin is the gray area to the immediate left of the editor where the line numbers are displayed. From time to time, you may see an icon (also known as a glyph) replace the line number to indicate some condition that exists on that line. Hovering the mouse pointer over a glyph will display a tool tip with more detailed information about the specific condition(s). Sometimes, you may see a small black arrow icon which indicates that there are multiple conditions on that line. Clicking on the black arrow will cycle through all the glyphs that apply to that line.